In the second part of our series on Rules, we looked at 3 Awares. If you have not read that part yet, please click here. We turn now to the threats that face every person. These 3 Threats are the reason for the 3 Awares. The first threat is Low. A threat that is low is the possibility of harm that surrounds us all. It can be as simple as leaving our home to travel to school or work or walking from our parked car to a store. As we are aware of the possibility of harm around us, we are able to move through life harm free most of the time. Situational awareness (staying alert and aware every minute of the waking day) is a key to dealing with all threat levels. The second threat is Medium. A threat that is medium is the potential of harm that each of can face. It can be as simple as standing at an intersection waiting for a light to change so we can cross the street or diving into a big wave at the beach. The potential threat of harm is near us and “could” happen if we’re not careful to watch for cars that might not stop for a red light or for something that may be inside or under the wave that we cannot see. Situational awareness (staying alert and aware every minute of the waking day) is a key to dealing with all threat levels. The third threat is High. A threat that is high is the probability of harm that each of us could face some day. It can be as simple as seeing several men walking toward you in a menacing fashion or as complex as someone grabbing you from behind and placing a knife to your throat. The probable threat of harm closes in on you rapidly and you must move quickly to protect yourself or others from harm. Situational awareness (staying alert and aware every minute of the waking day) is a key to dealing with all threat levels. Training in threat levels is a special focus of Grace Martial Arts classes. Each threat level (Low, Medium, High) has a unique response. We are preparing a new series on threat level training that will look at both the legal and martial aspects of protecting yourself and others. That series, Responding To Threats, is scheduled to begin at the beginning of the new year and will include photos and videos to help train you to deal with personal threats. 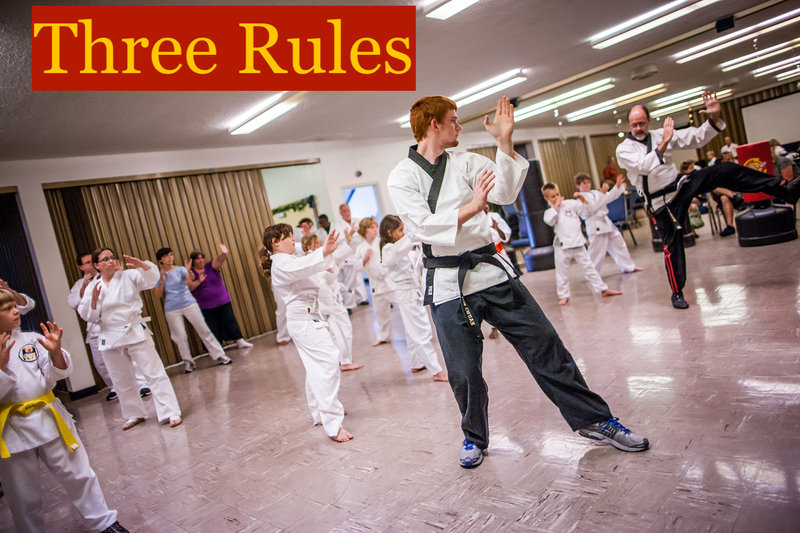 We will look at another set of Rules of Three for Grace Martial Arts when our special series continues next week.